They are perfect! The grey and gold look just as good in person as in the images on the website, and they go very well with other grey and gold decor I have in my dining room. The light is warm and radiant and really bring the surrounding area to life. Pleasantly surprised that it came with the light bulbs so I don’t have to go out and get them myself. Overall, these lamps have really enhanced my dining room and the credenza that they are placed on top of and everything else around it. A perfect choice at a great price. Designed for the elegant tastemaker, this contemporary table lamp is a modern heirloom. 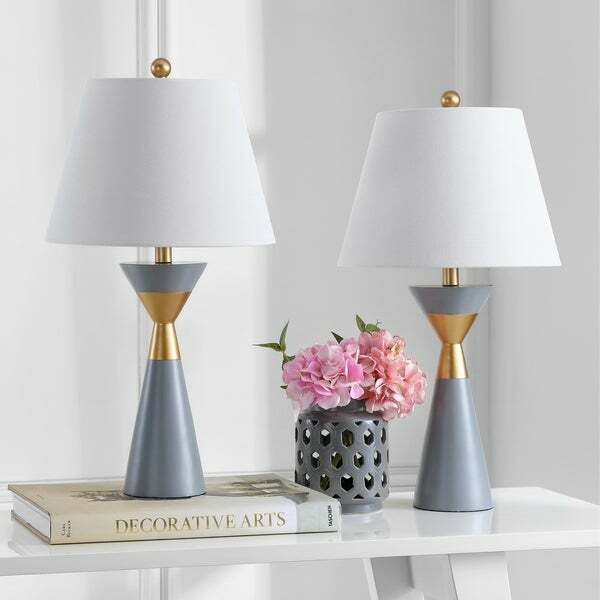 The perfect focal point for the stylish living room or bedroom, its shimmering gold finish compliments its smooth grey body and sleek off-white shade. Dimensions 14.0 In. X 14.0 In. X 26.5 In. Safavieh Lighting 24-inch Oliver Table Lamp - White / Gold (Set of 2) - 14" x 14" x 24"